With the Euro's in full swing and everybody sporting their colors of their nation or supported team, you almost get that World Cup 2010 feeling. Exactly 2 year ago 'philip' graced us with his presence and his presents. Fan parks filled with nationalities from all over the globe, women so beautiful you had to pinch yourself regularly to make sure you weren't dreaming. Alcohol flowing endlessly like Niagra falls and the beautiful game being adored by white, black, colored, asian, indian and everyone else I forgot to include. I cant exactly say the same for the current Euro's. Numerous cases of hooligan riots and attacks, certain fans racially abusing players and just general scenes that should not be associated with the beautiful game. Sure it is only a handful of culprits that is partaking in this debacle but I still had to bring it up. The irony is that everyone expected this hooliganism and violence during 'philip' stay in South Africa when actually it was the exact opposite. I have never seen a nation party and celebrate in such unity and in a dignified manner(I have a feeling Brazil 2014 will make me swallow those words). And even though 'philip' left us, his memory and what he brought to the nation will long be remembered. I'm pretty sure that even in my Alzheimer days in the retirement village, I will still talk about 'philip' and scream "Philip, he is here". The vibe and atmosphere here in Sweden is sort of the same but not remotely close to the 'philip' level. 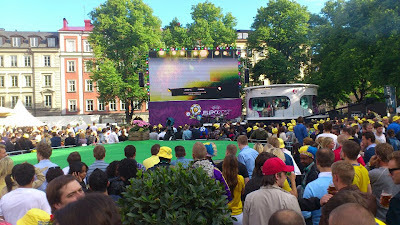 Even though Sweden has already been eliminated, the fan parks still fill up with cheering and loyal fans. The drinks are flowing, the fans are cheering and everyone is unified in their yellow and blue outfits; for now at least. The adventures of a young Capetonian lad in Sweden and Europe.